There are many ways to play golf. Perhaps I should say there are many different games you can play when playing golf. All of these games require at least 1 partner but in fact you don’t even have to be playing together. You can play separately and compare score cards later. Most people play stroke play and compare total score after the round. Again, there are 2 scores: a gross score and a net score, after adjusting your score based upon your course handicap. If you are playing the same course, you can compare scores hole by hole to see who won which holes. The person who wins the most holes, wins the match. This is true even if by stroke play (total score) that person shot a higher score. The standard match play format is 2 players hole by hole compare net scores. The person who wins the most holes wins the match. If you watch the Pros play in the Ryder Cup or in the Presidents Cup, the final day is 1 on 1 match play. Then the winning team for this format is the one with the most matches won. The US Amateur is also played in a match play format once the top competitors are determined by stroke play. The Ryder Cup and the Presidents Cup also showcase match play in 2 other formats. 2 man teams, playing Alternate Shot, play in a foursome. The winning twosome is the one with the most holes won. 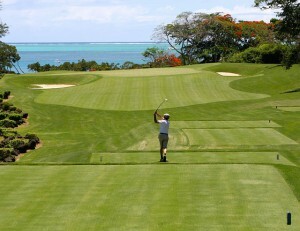 They also play Fourball which is each player in the 2 man team plays his own ball. The best ball of the 2 is counted and compared to the best ball of the other team. Again, the most holes won wins the match. The US Amateur starts as a 2-day stroke play event to pare the field down to the top 64 players. The next rounds are match play. First there are 32 matches, then 16 matches on the next day. In NCAA basketball and March Madness, it is called the Sweet 16. Then 8 matches, the 4 match quarter final, and the 2 match semifinal. The final is a 36 hole match play event, with a morning and afternoon round to crown a champion. The Senior Men’s Club in Discovery Bay usually plays a match play event the last Wednesday of each month. This event is played as match play within the foursome. The foursomes are made up of players with the same or similar handicaps selected by the computer. All 4 players compete against each other to win the hole but the rule is 1 tie all tie. Therefore, when 1 player may win the hole and another is putting to tie, you pull for that player to make the putt and tie. We play Front, Back and Overall. There is the possibility of 3 winners. Front ties are broken by comparing the last hole won starting from hole 9 and ties on the back are broken starting at hole 18. If there are any match play games you would like to add, please add them in the comment section. I would love to hear from you. Last Wednesday, the Senior Men’s Club held its annual Turkey Shoot. This is a standard 1 on 1 match play event with a full sit down Turkey Lunch (dinner) afterwards. Again the pairings are done by the computer and I drew my friend Lowell. We currently have the same handicap and both usually play the white tees, which is listed at 6042 yards. Some of the Seniors prefer the Brown tees, listed as 5587 yards. We have Super Seniors who play the forward tees at 5279 yards. I won’t go into some of the requirement rules for playing the forward tees in our normal competitions as since this was a match play event, the opponents could play whatever tees they agreed on. My match with Lowell was very interesting and did go to the final hole. Because of the shotgun start, we started on hole 17. The 17th at Discovery Bay is a beautiful looking hole over water with a bailout to the left. The front of the green is guarded by a large bunker after the water. To the right is only water. It is only about 130 to 135 yards to the middle of the green from the white tees. I hit a good shot landing on the green, hit a great lag putt and got a Par to win the hole. Lowell won the 18th hole so we were tied again. Lowell did not play as well as he could and had some blow-up holes. I was pretty consistent with how I played. When we finished the front 9, I was 3 up. I then won the 10th hole to go 4 up with 6 to play. Lowell said he would have to win 4 out of 6 holes to tie if I didn’t win another hole. The sleeping giant arose and Lowell won 11, 12 and 13 with some good chipping and excellent putting. We then tied the next 2 holes, 14 and 15. We went into 16, the number 1 handicap hole at Discovery Bay, with me 1 up. Unfortunately, Lowell had a bad hole and I was able to win the hole and the match with a bogey. It was a fun match and Lowell really turned up the pressure late in the match. I felt lucky to win as it easily could have ended in a tie. It did feel good to win. The Turkey meal was good and so was my beer. The USGA has specific rules for match play. The following is just a quick overview of some of the most common rules. A hole can be conceded to his/ her opponent by a player. Your opponent can concede your putt. Make sure it’s your opponent and not someone else who says “That’s good”. Rule infractions that in stroke play cause a penalty stroke, are usually loss of hole in match play. Contestants can agree on application of local rules, etc. If you are interested in all the USGA Match play rules you can check them out at the USGA site referenced below. Golf is a very heady game. In other words it is a very mental game. In fact it has been said by a famous golfer that “Golf is 90% Mental and 10% Mental”. It is also said that golf is played in the 6 inches between ones ears. I believe that it can be easier to get into your opponent’s head in match play than in stroke play. Let me give an example, that works in both match and stroke play, but I believe even more in match play. You usually play the white tees and your opponent prefers to play the brown tees (shorter). You insist on the white tees which are standard for the group. You probably have put your opponent at a disadvantage, out of their comfort zone. You concede some putts early and then make your opponent putt them out. You hit a very good lag putt where your opponent concedes your putt. Your opponent now has more pressure to make their putt to tie. 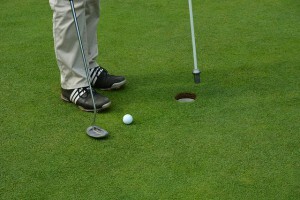 If you can get in the hole first and your opponent has a putt to tie, that becomes a tougher putt. Believe it or not golfers can trash talk. What’s your favorite golf strategy? Let me know in the comment section below.